If you have taken or plan to take our Lean Six Sigma Green Belt course, then you have the option to purchase and complete our Green Belt certification course. Complete a successful Lean Six Sigma improvement project. Green Belt certification represents the thorough study and proper application of Lean, Six Sigma and other process improvement techniques. It's an impressive accomplishment that can result in advancement at work and increased compensation and responsibility. Want to earn your certification? These steps are described in greater detail lower on this page. You are expected to complete the course and requirements within an 12-month period. Upon award of the certification, you will receive a signed certificate suitable for framing. Please note: there is no guarantee of certification, and the certification process is only available to MoreSteam students. How Does MoreSteam Compare to Other Certifications? We subscribe to the Green Belt certification standards established by the Center of Operational Excellence at the Fisher School of Business at The Ohio State University. As a result, MoreSteam certification is valued more highly by hiring managers and deployment leaders. If you would like to compare MoreSteam's Green Belt certification to other popular programs, such as ASQ and Villanova University, visit our Green Belt comparison page. The Green Belt is defined by a strong knowledge of Six Sigma and Lean methods and project management training. Depending on your industry or organization, you will see Green Belts either leading simple projects or working as a team member on a large project team. If your goal is to master this skill set and improve your value as an employee, then you should earn your Lean Six Sigma Green Belt. Certification - the recognition that you have both studied and successfully practiced the application of process improvement - is a more formal step in the process. It takes longer to acquire certification than training alone, but once you have done so, you will have proof of your competence and abilities. While certification is not required for Lean Six Sigma practitioners, most authorities and leaders value certification more highly, especially when it comes from a known and reliable source. The certification process begins with enrollment and the assignment of a Master Black Belt (MBB) coach. As you begin your training, you will begin to work on your project. The exam follows the training, and your final activity is the project review. Click on this link or on the image below for a larger view of the process. This is an online exam based on the Lean Six Sigma Green Belt Body of Knowledge. Read more about the details of the final examination below. MoreSteam requires successful completion of one improvement project that demonstrates effective application of what you learned in your course. The project must follow the DMAIC framework and must yield improvement in a performance metric that is important to your organization's mission. To help you keep track of your improvement project, you will receive access to TRACtion®, MoreSteam's online project management and tracking tool. Read more about the details of the project below. You can start your certification at any time, although MoreSteam certification is only for students in MoreSteam's Belt training courses. We recommend selecting the project during Course Sessions Two and Three on Define, and then working through your project as you progress through the course. We have designed the session exercises to facilitate that process. We estimate that Green Belt certification will take 12 months to complete (includes your training). We will consider extensions for extenuating circumstances. Upon award of the certification, we will send you a signed certificate suitable for framing. MoreSteam's Belt Certification requires that you pass a final Green Belt exam. This is an online exam based on the Lean Six Sigma body of Knowledge. You will need to have completed your MoreSteam training class prior to taking the final examination. Where is the test located? This test is online and available through the same MoreSteam University learning portal as the belt training class and the TRACtion project manager. The test is automatically graded once you are finished. You will be given an opportunity to review your results. If you do not pass on the first attempt, you can re-take the test once after a one-month waiting period. Can I complete my test as the last qualification for certification? Sorry, no. You must pass your exam prior to project review. MoreSteam's Belt Certification requires that you complete one successful process improvement project to prove that you have the ability to apply your knowledge. Projects are structured Belt activities that must follow the DMAIC framework and must yield improvement in a performance metric that is important to your organization's mission. To complete your certification, we require that you successfully complete improvement projects that demonstrate the effective application of what you learned in your course. You will receive access to TRACtion, our online project management and tracking tool. Once you have registered for and purchased certification, we will send you information on how to access and use TRACtion. 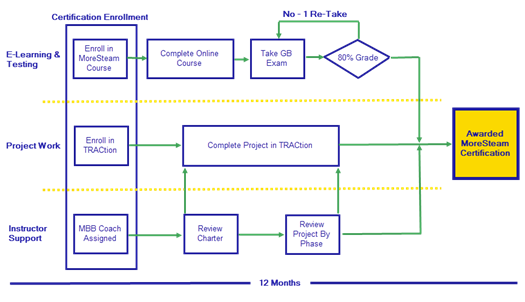 TRACtion guides you through the project process with critical questions, tollgate reviews, templates, links to training and more. Learn more about TRACtion. All Green Belt project requirements should be completed no later than 12 months after the start of Green Belt training and certification. If you are unable to meet the specified due date, we may grant you a short extension based on a reasonable written request. The request must clearly include proper justification in order for us to consider the extension. Will I receive help on my project? Our instructors are available to assist you. For example, it's a good idea to submit your completed project charter for review before you get too far along in your project to make sure it's acceptable and scoped correctly. All MBB commentary will be captured inside of TRACtion. For each project, we require a clear explanation of your actions. The final project report must include an interpretation of the process and results (i.e., what you did, why you did what you did, and what it means). In your final project submissions, you should include documentation to show mastery of the body of knowledge as described in the Project Requirements documentation (PDF). This certification has no pre-requisites, but you will need to either have taken or plan to take MoreSteam's Lean Six Sigma Green Belt online training course. You will need to purchase both the training and certification through the online store or by contacting MoreSteam directly. 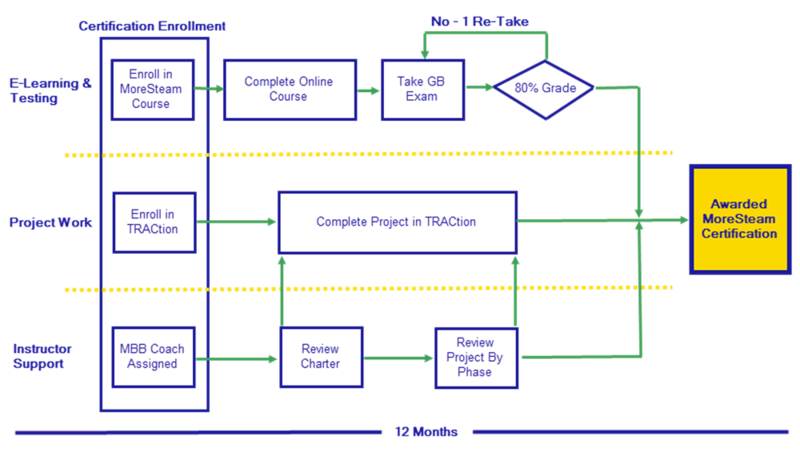 To help you manage your project, you will receive access to TRACtion, our online project management and tracking tool. Once you have registered for and purchased certification, we will send you information on how to access and use TRACtion. Why do we offer certification separate from training? Certification is a process that confirms your mastery of the Lean Six Sigma knowledgebase and proves you can successfully apply the tools and techniques to projects. Training providers who throw in a so-called "certification" at the end of their course are in fact only offering a certificate that shows knowledge, not proof of application. Experienced process improvement leaders and hiring managers discern this difference and place a far higher value on MoreSteam's rigorous certification process. What is the difference between Green Belt and Black Belt certification? Six Sigma practitioners adopted an advancement system that parallels martial arts -- the darker the belt, the more advanced skills held. For a visual example of the differences, view our online Lean Six Sigma Belt comparison graph. When it comes to training and certification, the distinction between what constitutes 'Green Belt' competency and 'Black Belt' competency varies across the industry. Find out how MoreSteam distinguishes between the two levels in this direct comparison table (PDF). You are required to recertify every five years to ensure that you are maintaining the knowledge and skills demonstrated on your comprehensive exam and certification project(s). The recertification model provides the opportunity to demonstrate ongoing professional activity in the areas of project work, continuing education, and coaching or teaching. Download the recertification overview and form. *Requires that you take or have taken our Green Belt training. Compare our Green Belt to the certifications of Villanova University and ASQ.